The xSenso Controller joins an existing xSenso sensor-networking product portfolio aimed at providing low-cost solutions for remote sensor monitoring and process control. Specifically, the controller is a compact, DIN-rail or wall-mount solution for enabling analog sensors — either voltage or current — to send real-time data to an Internet node or cloud-based application. It also can take actions based on certain set conditions. 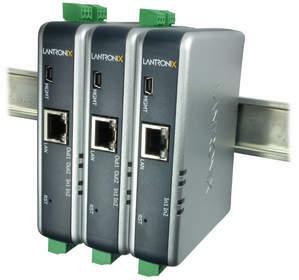 To that end, the controller includes new analog and relay outputs that give administrators more control over industrial processes in an automation system by using information from sensor readings, Mark Tullio, vice president of worldwide marketing for Lantronix, told Design News. “In other words, the analog and relay outputs enable you to instantly control industrial processes and equipment based on the sensor readings that xSenso picks up, and then actions are triggered based on predefined thresholds — all to solve real-world problems,” he said. xSenso Controller can be used to monitor the temperature of the transport vehicle’s refrigeration unit — if the temperature gets too hot [or goes] beyond the threshold, the controller can ‘act’ by controlling or turning on the cooling system to drop the temperature back into the correct range. The new controller also features web and mobile connectivity through web-based monitoring, charting and data logging, and http/https post connectivity from the sensors to cloud-based applications or apps hosted on a local web server. This supports a growing trend for more seamless connectivity in automation systems and gives administrators real-time access to sensor data “from anywhere at anytime — a very practical application for a variety of M2M communications,” Tullio said. Customers also can set xSenso to receive real-time email alerts when a condition changes or isn’t met based on pre-configured thresholds. The xSenso product family is compatible with a number of available data-acquisition systems used in automation solutions, including LabVIEW and DASYLab. Because the products are generally compact and efficient in their design, they can be installed in remote or geographically-dispersed locations, according to Lantronix.